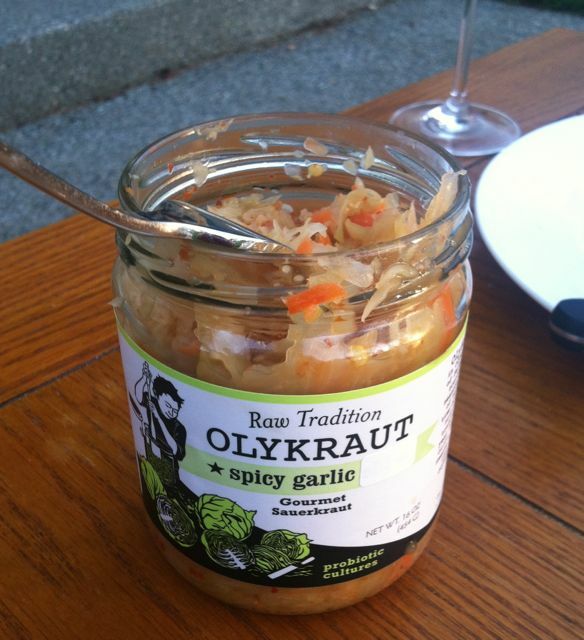 OlyKraut is brightly colored, crunchy and full of flavor. Fermentation is an ancient method of food preservation and flavor development. Fermented foods, such as bread, wine, and beer, have long been mainstream. However, raw fermented foods, often termed probiotics, have more recently been commanding real estate on shelves in traditional grocery stores, where they are popular as tasty vectors of helpful live cultures of bacteria. Sash Sunday, an engaging food activist and the owner of OlyKraut, credits two primary trends in food with creating the market for her pungent raw sauerkraut and fermented brine products. One driving force is the foodie or artisanal demographic. These individuals are fascinated with the movement away from highly pasteurized, processed foods to more traditional methods of food preparation that result in tantalizing flavors, deemed worthy of the associated extra costs and time. The second driver are people who are increasingly convinced of the link between the consumption of raw fermented foods with health and wellness. Many people struggling with food sensitivities, allergies, and disease have turned to cultured foods, including miso, kefir, kimchi, kombucha and yogurt, to replenish their gut flora and heal their bodies. Scientific studies also support the connection between a healthy gut microbiome and mental well-being. Founded in 2008, OlyKraut has been doubling their production annually. Sash is quite pleased to partner with largely local farmers. Last year, she sourced 60,000 pounds of cabbage and employed local workers to handcraft a healthy food that not only electrifies the tongue but also nourish the body. Sauerkraut was a natural draw for Sunday because of the increased bioavailability of the cabbage nutrients due to the bacterial breakdown, cabbage’s anti-cancer and anti-inflammatory properties, and the incredibly simple method of preserving the cabbage through acidification as the Lactobacilli produce lactic acid as a byproduct of their metabolism of lactose and other sugars. Did I mention that it’s delicious? OlyKraut products are sold in 60 locations throughout Washington and in the Portland area and can also be sampled at a variety of farmers’ markets or purchased as an add-on through many local community-supported agriculture (CSA) programs, such as those of Oxbow Farm and Helsing Junction Farm. 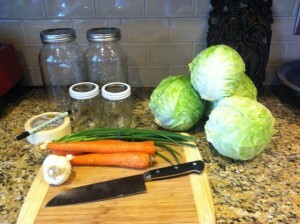 Here is everything you need to make a batch of raw fermented sauerkraut. Consumers in the Olympia area are fortunate to have many high-quality fermented foods at their fingertips. There are also great resources available to get you started if your interests include culturing ferments at home as a low-cost way to add healthy probiotics to your family’s diet. Meghan Hintz, a certified fermentationist and LMP who is deeply interested in digestive healing, recently taught Sauerkraut 101 to a group of 20 budding home cabbage connoisseurs at Eastside Urban Farm and Garden Center (EUFGC). This is just one of their many great classes offered at the bargain price of $10. Participants enjoyed tasting some of OlyKraut’s fare while Meghan shared the science behind sauerkraut ferments of anaerobic bacteria and their preferred environments, what types of ingredients work well in sauerkrauts and, correspondingly, which foods to avoid adding. Then she walked us through the actual method itself by preparing a green cabbage, fennel, daikon radish, and green onion kraut. We each tasted the salted cut vegetables to familiarize ourselves with the proper amount needed to maintain the crispness of the vegetables – it should be tasty like a chip. I was impressed by the level of questions attendees had regarding the type of kraut equipment to use, the ideal temperature and light conditions for ferments, and tips for identifying unsafe ferments gone rogue. Interestingly, each type of bacteria has its own preferred pH level, and the pH of finished krauts, which typically ranges from 3.8 to 4.2, is incompatible with the dreaded botulinum toxin-producing pathogen Clostridium botulinum. 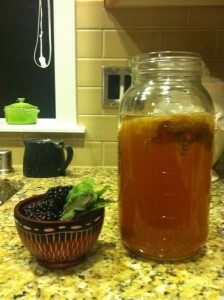 Ingredients such as blackberries and sage can be used to flavor home-brewed kombucha. Note the SCOBY floating at the liquid-air interface. This feature of bacterial life contributes to the potency of sauerkraut because you are not only consuming colony-forming units (CFUs) of microbes but you are also ingesting their preferred environment, which may help them successfully traverse the stomach and establish colonies in the small intestine. Meghan was a knowledgeable and pleasant educator, and the experience gave me one more reason to adore EUFGC, a fantastic local resource for people who want to grow and make their own food. Each day that I pass by my freshman ferment on the kitchen counter, my anticipation grows. Another easy way to get started with home fermentation is to brew your own probiotic drinks using an organic, live-culture starter kit from Oly-Cultures, another local company started by Julie Kamin after years of helping friends culture kefir and kombucha. In addition to milk and yogurt kefir grains, you can purchase a kombucha symbiotic culture of bacteria and yeast (SCOBY), and using just tea leaves and sugar, you can propagate your own kombucha. By performing a secondary fermentation in a closed jar, you can create a carbonated tea that can be flavored in endless combinations. Just don’t let it ferment more than a few days or the pressure may crack your container. Our blackberry sage kombucha was a hit, and the best part is that you can reserve a portion of the previous brew and have an endless supply after your initial investment. Be adventurous; there are lots of tasty ways to experiment with raw fermented foods, and it just may improve your health.